Can I copy settings between companies and groups? Settings can be copied to one company from another company, or to a consolidated group via the copy settings link at the bottom-left of the setup screen. This link is available in the company setup, in steps 3-6 (Chart of Accounts, Select KPIs, Set Targets, Set Alerts). If "Chart of Accounts" is ticked, the COA layout and settings will be copied from the company you have chosen. For more information and instructions on how to copy the COA layout, see: Copying Chart of Accounts layout between companies or groups. If "KPIs" is ticked, the configuration of the "Select KPIs" page of the company setup will be copied from the company you have chosen. Fathom & KPI Library KPIs selected in the master company. Not-relevant KPIs will also be copied, but marked as not-relevant in company being copied to. KPI Importance (also indicates whether a KPI is enabled). Note: existing KPIs that are not in the master company will be disabled. Any KPIs which are not from the organisation’s KPI Library. Any categories which include only company specific KPIs. Financial KPIs and any Formula KPIs that depend on the financials, if the company being copied to doesn’t have financials. If "Alerts" is ticked, the configuration of the "Alerts" page of the company setup will be copied from the company you have chosen. If "Targets" is ticked, the configuration of the "Targets" page of the company setup will be copied from the company you have chosen. The target values for KPIs which the master company has in common with the company being copied to. Target values for KPIs which exist in the company being copied to, but not the master company, or vica versa. Budget values are never copied - only the underlying target values which would be used if a KPI was not set to use budgets. Copy settings can be used to copy all of the above settings from an underlying company to a consolidated group, from a consolidated group to an underlying company, or from one consolidated group to another group. When Chart of Accounts settings are copied to a consolidated group, the account classifications in the consolidation will never be changed. The consolidation will always reflect the account classifications which have been set in Step 3 of the setup for the underlying companies in the group. Copying settings from an individual company will not overwrite the classifications already set up in a group. 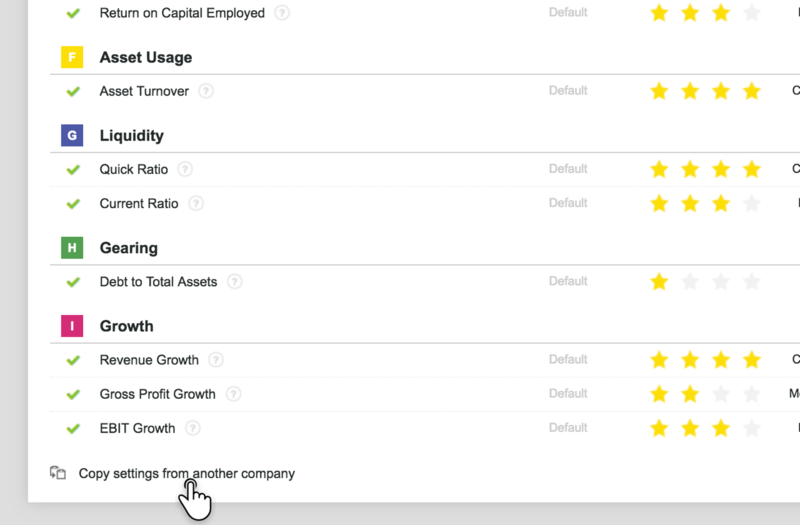 When copying KPI settings to a group, company-specific KPIs will not be copied to the group. For a custom KPI to be active in a consolidated group, it must be added to the KPI Library, and to each underlying company in the group.